On May 1 , when American war fatalities stood at 138, President Bush declared ‘Mission Accomplished’ in Iraq. By the end of the year the figure was 486. US forces completed their withdrawal at the end of 2011, and by 2012, when the last American death was confirmed, the final tally was 4,486. For much of the period in between, Baghdad was a surrealist dystopia divided between the six square miles of the Green Zone, formerly the heart of Saddam’s regime, and the Red Zone, or everything that lay beyond it. From April 2003 the Green Zone was a heavily fortified enclave of Little America in which officials and contractors in the Coalition Provisional Authority (CPA) led by Paul Bremer [a US diplomat and former businessman] had ‘team huddles’ and sat in front of computer screens prettifying PowerPoint presentations about ‘metrics’, ‘deliverables’ and ‘the drumbeat’ of progress. Many of those who worked inside this bubble were contractually forbidden to leave it in the course of their duties. They inhabited a cocoon of continually evolving acronyms, dodging IDF as they shuttled between the multiple offices of IRMO, PCO, ORHA, ICC, GRD, LMCC and MNF-I before downing pens for a bacon cheeseburger, Baskin Robbins ice cream and a Gatorade at the DFAC and perhaps knocking back a few discreet beers and whiskies later in the BCC. Once in a while there would be a Rhino run down Route Irish — the most dangerous stretch of asphalt in the world — to BIAP, on which passengers prayed hard to avoid VBIEDS, IEDs, RPGs and SAF*. It was an improbable stage with an unlikely cast: a multicultural mix of neocons and ideologues, army officers in a permanent hurry, soldiers in grey T-shirts and black gym shorts with M4 rifles slung across their shoulders, close-cropped helicopter pilots in sweat-marked flying suits, smartly suited political advisers in button-down Oxfords and wrap-around shades, tattooed, goatee-bearded security contractors in Tactical 511 combats, impassioned gender advisers, rule-of-law and security-sector reform experts, tribal analysts, fast-talking IT systems managers, Filipino laundry staff, tractor drivers from Texas, catering staff from Bangladesh, rehatted South African mercenaries, American engineers, Chinese restaurateurs and masseuses, the occasional blue-bereted UN official from Britain or Australia, procurement and logistics contractors, would-be, latter-day Lawrences, war profiteers, opportunists and poseurs, romantics, dreamers and schemers. Occasionally you would see the odd Iraqi — perhaps a VIP, translator, political adviser or gardener. But this was a world, by and large, in which Iraqis were not welcome. Numerous signs around checkpoints, bristling with barbed wire, 17-feet blast walls, sand-filled barriers and twitchy, heavily armed soldiers and security contractors, told drivers: DO NOT ENTER OR YOU WILL BE SHOT. * Indirect fire; Iraq Reconstruction Management Office; Project and Contracting Office; Office for Reconstruction and Humitarian Assistance; Iraqi Convention Centre; Gulf Region Division [of the US Army Corps of Engineers]; Logistics Movement Control Centre; Multi-National Forces — Iraq; Dining Facility; Baghdad Country Club; Baghdad International Airport; Vehicle-borne improvised explosive devices; improvised explosive devices; rocket-propelled grenades; small-arms fire. 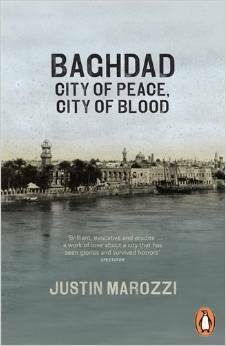 Extracted from Baghdad: City of Peace, City of Blood by Justin Marozzi, published in paperback by Penguin at £9.99. © Justin Marozzi 2014. For more about Justin Marozzi’s writing, see his website.